In life, there is a summons that is often threatening, provocative, and stimulating; a hard nut to crack that tries to dash our hope and defeat our expectation at fulfilling our purposes for living. Great people like Abraham Lincoln, Martin Luther King Jr., Mother Teresa, George Washington, Maya Angelou, Marie Curie, Nelson Mandela, David Livingstone, Christopher Columbus, Thomas Jefferson, John Glenn, Albert Einstein, Isaac Newton, Neil Armstrong, Bill Gates, Anyaele Sam Chiyson and even President Barack Obama overcame the challenges of life to crown themselves with success. You too can be flushed with succeeding in accordance with your desires and perfect your purpose for living. In this exceptionally well-informed and thriving book, Ifeanyi Enoch Onuoha gives you what it takes to keep yourself on the right footing to be upstanding and outstanding, and bring all you want to achieve to a happy issue. In this day and age, there is a greater call to build your self-assurance, overcome anything that upset your applecart, develop understanding of who you really are, develop what it takes to be at the top line and on top of things, develop persistence and an expectant winning attitude, take charge, develop the quality of mind to do what it takes and a mindset that is loaded with state of well-being. No matter where you are at the moment, you have a life; make a success of your life. This book will fill you with immediate and immeasurable apprehension to be on the systems and be significant through out the system that drives the progress of human race. It will also fill you with what it takes to bring your desires to a happy issue. You are a SUCCESS! You are living at the best time of life. Overcome as much as you can; make the principles in this life-changing book the light that enlighten your intelligence as you become a shining and burning light that lighten places. 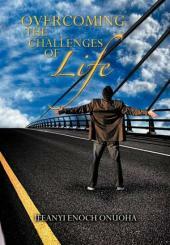 OVERCOMING THE CHALLENGES OF LIFE by IFEANYI ENOCH ONUOHA is a powerful book that you must have and read. This book enriched my life greatly and am grateful to God. The content supercedes greatly the money I used in buying it. I endorse and recommend it. I have read books but this book OVERCOMING THE CHALLENGES OF LIFE by IFEANYI ENOCH ONUOHA, metamorphosed my life positively and I thank divinity for giving the author the ability to enrich humanity with this masterpiece. You need to read this book to be the best, I it recommend for you, your family and friends! This book empowers, enlightens and enlivens your life with a message of hope and inspiration; it is a must read for all and sundry. I have read books but this book is loaded and enriching. Thank you Ifeanyi for writing this great book OVERCOMING THE CHALLENGES OF LIFE. I recommend it to all! This is a treasure I cherish so much. The book is loaded with treasures and great wisdom. There are books but this book OVERCOMING THE CHALLENGES OF LIFE by IFEANYI ENOCH ONUOHA is a great masterpiece and beautifully written. I love it! To be able to put two and two together, you need the ebullience, sapience, sagacity and excellence in this book. There's no need going to the school of hard knocks, the homework has been done for you by IFEANYI ENOCH ONUOHA in this magnum opus titled OVERCOMING THE CHALLENGES OF LIFE. Get your copy, read and be an overcomer. The truths and principles in this book are eternal. It is your wisdom to build your eternal kingdom with them. A masterpiece, this masterwork is all you need to be a master. This is a book that will enable you make statements without saying a word. It is a must read for all. To be on top in all areas of life, you must read OVERCOMING THE CHALLENGES OF LIFE by IFEANYI ENOCH ONUOHA. It is loaded with what you need to excel. If you want all insider wisdom on how to personally get and stay successful, buy and read this book, give it as gift to people. OVERCOMING THE CHALLENGES OF LIFE by Ifeanyi Enoch Onuoha is one book I can't stop reading. It is filled with ageless wisdom that is positively impacting lives positively worldwide. Do not borrow, get your personal copy and also buy for others. I endorse and recommend it for you, if you desire to be a success. I have read this book, it is masterly written and the wisdom in it transcends ages. I endorse and recommend it for you, read it and live higher life. You have not read any book like this before now. No matter what you have gone through or are going through in life, there's an answer for you in this book titled OVERCOMING THE CHALLENGES OF LIFE by IFEANYI ENOCH ONUOHA. I endorse this book. this is a timeless success compendium for all those who wants to live a higher life. Namaste! Read and live great. This is one of the best books I have read. Thank you my brother for writing this masterpiece. The truths in it are eternal.